In Denmark a Master of Business Administration is not at all the same as a Master of Social Science – but what is the difference? 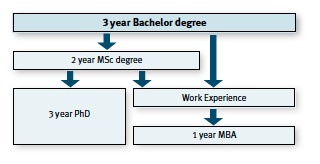 The structure of Danish higher education is 3-year bachelor degree, which can be followed by a 2-year master degree (not MBA). Students can then apply for a 3-year PhD programme (under 1 % of Danish graduates chooses this). After working for a number of years it is custom to further qualify your skills by doing some sort of continuing education. Master of Science is an academic 2-year degree consisting of 120 ECTS. To be eligible for admission to one of the MSc- programmes applicants are required to have a relevant bachelor degree within business administration that fulfils the specific entry requirements of the programme. Only the academic credentials of the applicant are taken into consideration for admission. The typical student is between 21 and 25 without much practical experience. The tuition fee for Non-EU and non-EEA students is 12,500 € pr. year (2012). The Full-time MBA is an exclusive programme with a focus on Responsible Management that attracts talented young professionals from around the globe to Copenhagen. Over 90% of the class is international, 40% is women, the average amount of work experience is five years and average age is 30 years. The admissions board assesses the candidate's full profile during the admissions process, including professional and academic achievements, motivations for doing an MBA, post-MBA career goals and personal maturity. Applicants are expected to have a university degree (minimum bachelor's degree) or equivalent professional qualification and have at least three years of relevant work experience. Tuition fee is DKK 330,000. There are a limited number of CBS scholarships available, and candidates are evaluated based on need and merit. CBS also offers an Executive MBA with Flexibility (duration: 26-60 months), a Global Executive MBA (duration: 20 months) and an Executive MBA in Shipping and Logistics (The Blue MBA, duration: 22 months).